Often in trading we become totally engrossed in searching for short-term opportunities with a hyper-focus on news flow and daily price movements. Occasionally it’s good to drastically alter time frames, especially if your creativity has dried up on short-term ideas. One way to search for new trades is to scan asset classes that have performed the worst over the previous decade. This is especially interesting when there’s been a large divergence of performance in asset class returns over the previous 5 to 10 years. Table 1 shows a ranking of the worst-performing ETFs by 10-year annualized returns as of October 31, 2017. When tabulating this ranking, I excluded the ProShares daily leveraging funds and commodity exchange traded notes. For comparison, the S&P 500 returned 7.51% per year during this time frame. 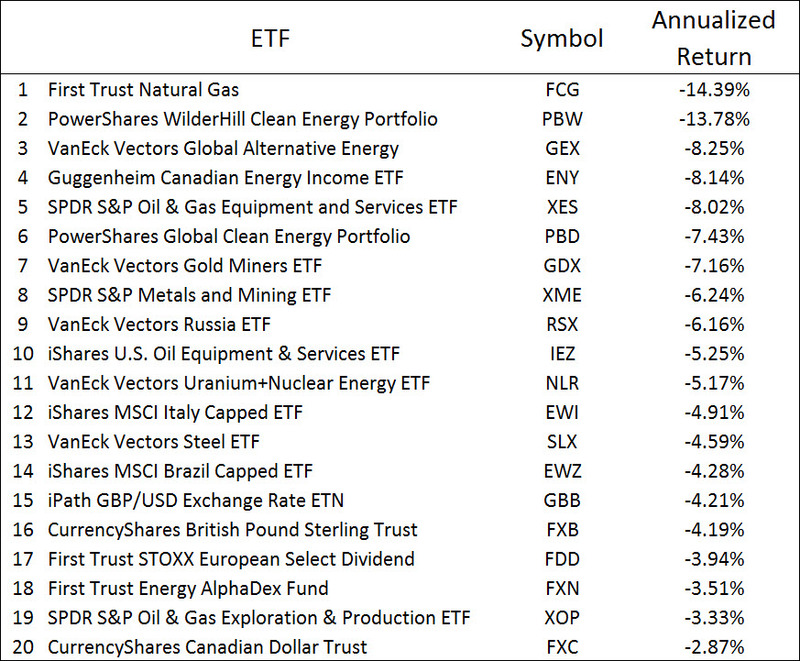 This list contains many ETFs in the energy space, with a few niche asset classes (clean energy, gold miners, steel and nuclear), country funds (Russia, Italy and Brazil) and two currencies (British pound and Canadian dollar). Table 1: Worst-performing U.S. ETFs based on 10-year annualized returns, as of October 31, 2017. (Note: S&P 500 return over same period was 7.51%/year). Source is Morningstar. Does Experience Provide an Asset Class Trading Edge? Does experience trading the markets provide an actual trading edge? Surely an investor who’s seen many bull and bear markets has an advantage compared to a novice just starting out in the field. The beginner is an alpha source for seasoned traders as the former pays their “tuition” associated with learning how to trade. The counterargument, using efficient markets logic, suggests that if a great number of portfolio managers (PMs) have significant experience, then the performance benefits of experience become arbitraged away as prices quickly incorporate the collective wisdom of the pros and experts. Fund marketers ignore the efficient markets logic and advertise portfolio manager experience because it’s very convincing to most customers. I’ve traded asset classes for about 20 years. I’ve experienced two major and several minor bear markets, and seen a variety of bull markets. When I assess my current trading edges, I admit I’ve started putting “experience” as an edge – although at times with a question mark behind it. Studies show that manager tenure and experience has little impact on mutual fund performance.1 I’ll speculate that the constraints associated with mutual fund portfolio management greatly inhibit the use of experience as an edge. Prospectus limitations on what securities can be purchased and the requirement to stick with an established investment discipline limit the flexibility to use experience to add value. Career risk can also drastically alter a PM’s personal risk-return profile, inhibiting the use of experience to benefit clients. Seasoned relationship managers and investment advisors can be highly valuable to their clients since they draw on experience to help a client weigh the pros and cons of making a decision – especially in stressful moments. Of course, their job is not about adding alpha, although many claim they can. 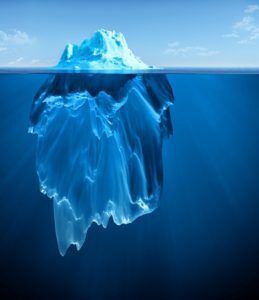 Just because a person has 20 to 30 years in the industry doesn’t mean they automatically have an “experience edge” that translates into superior performance. Many PMs are not intentional in how they learn from their experience. They’re lazy. In the Market Tells – Part 1 blog, I introduced the concept of market tells as an enduring trading edge that can be used to enhance returns over the long term. Developing the ability to identify market tells and act on these signals takes practice. It’s important to keep track of trading results to get better and gain confidence to jump on these opportunities in size when they occur. In this blog, I first clarify thoughts on a few instances when the market tell guidelines are not met. The most important guideline for identifying a market tell is the 80% rule, which states that to consider market action as unusual (and thus providing a market tell), the usual behavior must occur at least 80% of the time. Otherwise, it’s just too difficult to associate the unusual behavior with a market tell rather than normal market gyrations. Next, I’ll review three more market tell techniques that can be used to trade asset classes. I’ll close with some thoughts on crowded trades and implementation hints. On some days, one sector may be up while the rest of the market is down. If the behavior is explained by news, then this price action is totally normal. Even without news, this sort of divergence occurs often enough to consider it normal activity. If a security is illiquid, such as a closed-end fund, then this action might be correcting a stale price from the previous day, which is not unusual at all. To contrast, if all risky assets are aggressively moving higher (such as when the S&P 500 is up 2%+ for the day), and one sector is flat, then this behavior is much more unusual and may be the basis of a market tell, especially if no news explains the behavior. However, we need to remember that the time scale of this edge is on the order of a day or two. Watching how a stock or asset class reacts to news associated with a known announcement date (such as an earnings call or a central bank news release) is very difficult to use as a market tell. There is usually an enormous amount of trader attention to these known release dates, which probably means there’s no trading edge. Much of the news and all the probabilistic outcomes have been priced in before the announcement, which is another way of saying the pre-announcement price is set such that there is no edge in buying or shorting the security ahead of the announcement, or in fading or chasing the post-news reaction. Finally, watch out for interpreting short-term market action when there’s a lot of unwinding of positions. For instance, at the first of the year, it’s best to wait a week before interpreting market action as hedge funds unwind their end-of-year trades. This sort of behavior can occur during bear markets also. This is a very chaotic time when a lot of unwinding is occurring – it’s a very difficult time to interpret market action versus any sort of playbook. Wait until the dust settles and stocks start moving in unison before interpreting market action. In discussing market tells, I’ve used the term “divergence” to describe local price action where an asset class’s price or relative strength line is diverging from normal expectations. Searching for divergences is a staple of technical analysis.1,2 In the past I have falsely interpreted a divergence as a market tell. 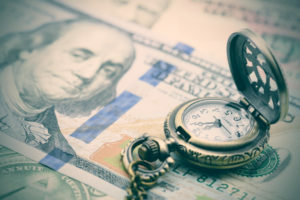 These misinterpretations generally occurred during relatively quiet times in the market, usually during bull markets, when the 80% rule did not apply. In any competitive field, the awareness of tells can provide a significant and enduring edge. Most people think of poker when they hear about tells.1 Is a player acting strong to encourage other players to fold? Does a player seem nervous when they throw their chips in the pot? 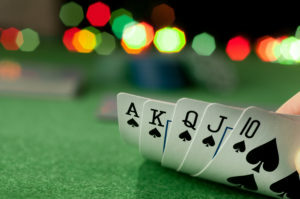 Can any useful information about an opponent’s poker hand be gleaned from these actions? Tells occur in many aspects of life and competition. For most sporting events, searching for tendencies in an opponent’s play is an integral part of game preparation. In the home arena, parents look for facial clues when interrogating a fidgety teenager as the youngster explains what she’s doing on a Saturday night. Tells are an important source of feedback when trading the financial markets. I call these “market tells” to distinguish between the variety of tells that occur in other forms of competitive environments (more on this distinction later). A market tell is a powerful approach to sensing moments in time when market participants are not positioned correctly. A simple example of a market tell is a stock that’s acting strong when it should be weak. Perhaps the stock is in an uptrend when extremely bearish news is released about the prospects of the company (such as a product recall). Unexpectedly, after a momentary dip on the news, the stock price continues to go higher. That’s a positive tell for future outperformance. Properly identified, tells can get you out of a trade much sooner than waiting for a technical trend-following sell signal. Tells can help you identify future outperforming asset classes. 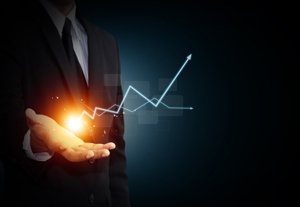 They can provide positive feedback that a current trade is working. No matter what your trading discipline or time scale, searching for market tells is a great trading edge. The more you clarify and develop your thoughts around market tells, the more confidence you’ll have to quickly jump on trades and to trade with high conviction and size. I began noticing market tells soon after I started trading in the late 1990s. In 2005, I decided to be more disciplined about it by keeping track of results. When I observed a tell, I printed out a chart and documented what I expected to happen, and then slipped the paper into my “market tells” folder. I also traded on this information, and over the next four years, avoided looking at the results. In mid-2009, I checked to see how these predictions worked. The success rates for these trades at both the short and intermediate time scales were excellent. These results piqued my interest to further investigate and refine the use of market tells in my trading. In 2014, I performed yet another trade analysis, and in 2017, I find myself slightly reshaping my views while writing this blog.